Thumpy originated as an educational concept to invite and motivate especially the younger generation to enter the wonderful world of flute playing. 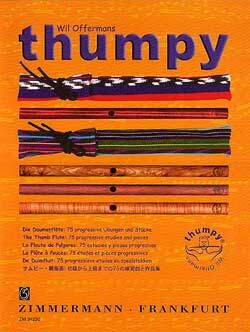 Thumpy© the thumb flute is a relatively simple instrument with a surprisingly natural sound. 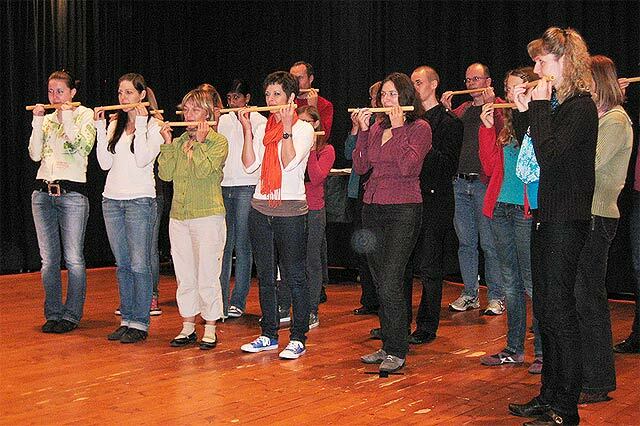 The Thumpy flute is most suitable as a beginners flute for those who want to learn to play (Boehm)-flute. But it is also a challenging and enjoyable flute for advanced flutists who want to enhance their tone and embouchure flexibility. The focus is on the essence of the flute-playing: the flute sound and the blowing. The Thumpy is available in three models: the Junior, the Classic and the Classic Pro, which are described below. The Quick Start explains how to play the basic sounds, as well as various harmonics. Furthermore, you will find a section about imitating Bird Songs, an extended guidance for Flute Teachers and finally the Studio E Online Shop to order Thumpy flutes online. This new flute has been designed and developed by Dutch flutist-composer Wil Offermans and is manufactured by Studio E Music Creation, Granada, Spain. The Thumpy Book by Wil Offermans is published by Musikverlag Zimmermann. 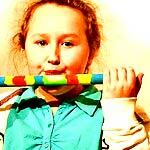 Thumpy© the thumb flute is a relatively simple instrument with a surprisingly natural sound. The Thumpy flute is most suitable as a beginners flute for those who want to learn to play flute. But it is also a challenging and enjoyable flute for advanced flutists who want to enhance their tone and embouchure flexibility. The focus is on the essence of the flute-playing: the flute sound and the blowing. The Thumpy is available in three models: the Junior, the Classic and the Classic Pro, which are described below. The Quick Start explains how to play the basic sounds, as well as various harmonics. Furthermore, you will find an attractive section about imitating Bird Songs, an extended guidance for Flute Teachers and finally the Studio E Online Shop to order Thumpy flutes directly online. Thumpy offers an excellent experience in learning to play a first flute sound. 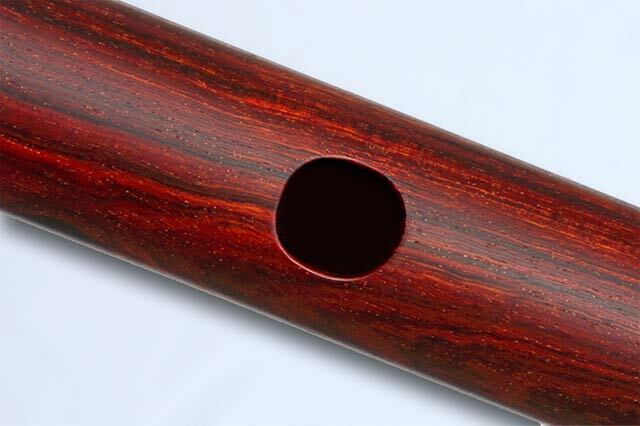 Compared to the flute head-joint - often used to try to produce the first flute sound - Thumpy extends and deepens the fundamental study level and gives the player an attractive and rich musical experience from the very first flute sound. 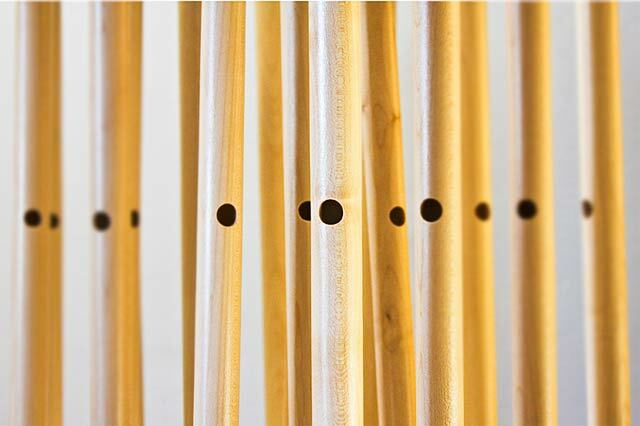 Since Thumpy is an unconventional and non-chromatic instrument, its simplicity is demanding a musical sense which will help to naturally develop the embouchure and the breathing. Here the blowing is directly connected with a musical result. From the first practice - and without the usual stress of holding the flute and placing the fingers - we can focus to shape the sound. 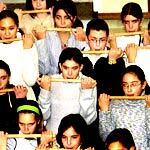 Once a kid moves on to the (Boehm)-flute, the experience with the Thumpy flute will contribute to a better sound and a relaxed and flexible performance. 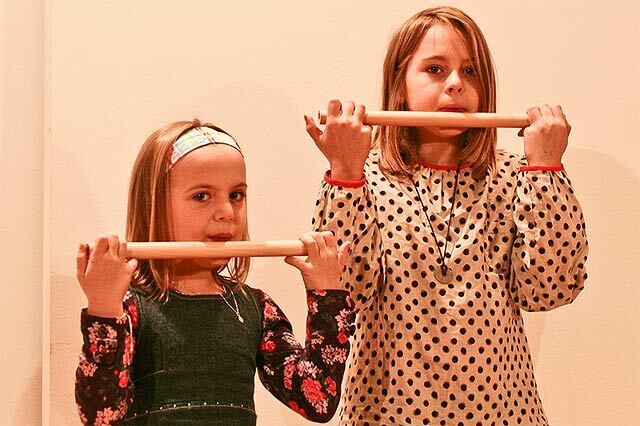 Thumpy is a simple way to determine a child's talent and interest for the flute, without having to invest in an expensive flute. I use the Thumpy and the Thumpy Book to teach beginners for the first several months and always have a nice result. The sound quality of the kids becomes much better when starting with the Thumpy compared to the flute head-joint. 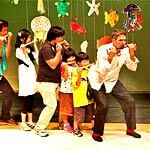 We used Thumpy in a theatrical music creation and some games with kids and had lots of fun! At first, Thumpy was also a bit difficult for me and indeed I had to focus on the blowing to get the right pitch. It is a good instrument to develop the embouchure, breathing and sound quality. Kids love Thumpy. It’s simple, solid and easy to position. 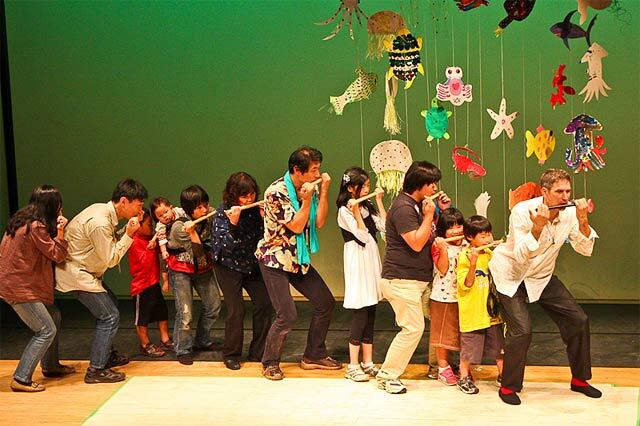 Kids can try to flute at any moment. The Thumpy Junior is the basic, low-priced model, most suitable for kids, the beginner, the music enthusiast or for those who are just curious to try the Thumpy flute. De Thumpy Junior is het economisch geprijsde basismodel, vooral geschikt voor kinderen en beginners of voor iedereen die de Thumpy duimfluit eens wil uitproberen. Die Thumpy Junior ist das grundlegende, kostengünstige Modell, bestens geeignet für Kindern, Anfänger oder für diejenigen, die einfach mahl die Thumpy Flöte versuchen wollen. La Thumpy Junior est le modèle de base à bas prix, le plus approprié pour les enfants, les débutants, les amateurs de musique ou pour tous ceux qui sont simplement curieux d'essayer la flûte Thumpy. Thumpy Junior es el modelo básico de bajo precio, adecuado para los niños, los principiantes, los entusiastas de la música y para aquellos que simplemente tienen curiosidad de probar la flauta Thumpy. The Thumpy Classic is a high-quality model, suitable for the advanced flutist, the flute-teacher or for any flute loving amateur. De Thumpy Classic is een hoog-kwaliteit uitvoering, geschikt voor de gevorderde fluitist, de fluitdocent of de fanatieke fluitliefhebber. Die Thumpy Classic ist ein hochwertiges Modell, geeignet für den fortgeschrittenen FlötistIn, FlötenlehrerIn oder für begeisterte Amateure. La Thumpy Classic est le modèle de haute qualité, adapté pour le flûtiste avancé, le professeur de flûte ou pour l'amateur de flûte. La Thumpy Classic es un modelo de alta calidad, adecuado para el flautista avanzado, los profesores de la flauta o para cualquier aficionado de la flauta. The Thumpy Classic Pro is the top model in the Thumpy range, suitable for any professional flutist, flute-teacher or for any profound flute lover. De Thumpy Classic Pro is het topmodel in de Thumpy-serie, geschikt voor iedere professional, fluitdocent of intense fluitliefhebber. Die Thumpy Classic Pro ist das Top-Modell in der Thumpy Reihe, geeignet für jeden Profi-FlötistIn, FlötenlehrerIn oder für jede aufgeregte Flöten-LiebhaberIn. La Thumpy Classic Pro est le modèle haut de gamme, adapté à tout flûtiste professionnel, professeur de flûte ou pour tout grand amateur de flûte. La Thumpy Classic Pro es el modelo superior de la gama de Thumpy, adecuado para cualquier flautista profesional, los profesores de la flauta o para cualquier amante profundo de la flauta. * price includes 21% VAT tax, which will be deducted to non-Spanish customers inside the EU with a valid VAT number and to all customers from outside the EU. * prijzen zijn inclusief 21% BTW. Deze belasting zal bij niet-Spaanse klanten binnen de EU met een geldig BTW-nummer en bij alle klanten van buiten de EU niet in rekening worden gebracht. * Preis beinhaltet 21% Mehrwertsteuer. Diese Steuer wird bei nicht-spanischen Kunden innerhalb der EU mit gültiger UID-Nummer und bei alle Kunden von außerhalb der EU abgezogen. * prix comprend 21% TVA, qui seront déduits pour les clients non-espagnoles à l'intérieur de l'UE avec un numéro de TVA valide et à tous les clients de l'extérieur de l'UE. * precio incluye el 21% de impuesto de IVA, que se descontará a los clientes no españoles dentro de la UE con un número de IVA válido y para todos los clientes de fuera de la UE. The Thumpy Book by Wil Offermans (also available at your local music store), published by Musikverlag Zimmermann (ZM34230) introduces the Thumpy flute and its technique in 75 progressive solo and duo pieces with explanations in English, German, French, Spanish, Dutch and Japanese. Here below are some sound samples from the Thumpy Book. Thumpy is also recorded on these CD's by Wil Offermans: The Magic Flute and Luna y Sierra. Below we have collected some of the most frequently asked questions concerning Thumpy. Click a question to display the corresponding answer. Feel free to contact with us whenever your question is not listed. Is Thumpy only for children and beginners? Certainly not, as anyone can play the Thumpy! Beginners can enjoy it to discover a first flute sound in a spontaneous and amusing way and develop a flexible embouchure (before moving on to the 'big' flute). However, Thumpy is also a challenging flute for advanced flutists, to develop further flexibility in their tone and embouchure, or for studying whisper tones or circular breathing. See the page Flute Teachers for further ideas and thought. From which age can a child start playing the Thumpy? That may differ per child, but from 7 years, and sometimes even earlier, is possible. Important point is whether a kid can close the endings with the thumbs (the centre ending-holes are 14 millimetre). Which notes can we play on the Thumpy flute? The basic five pitches are: F - Ab - C - Eb - F. However, Thumpy is a most 'analogue' instrument, which can produce many 'micro-tones', which we cannot find on the piano. See more about the basic five tones and sound samples on the Quick Start page. Is the coating of the Thumpy Junior safe for children? 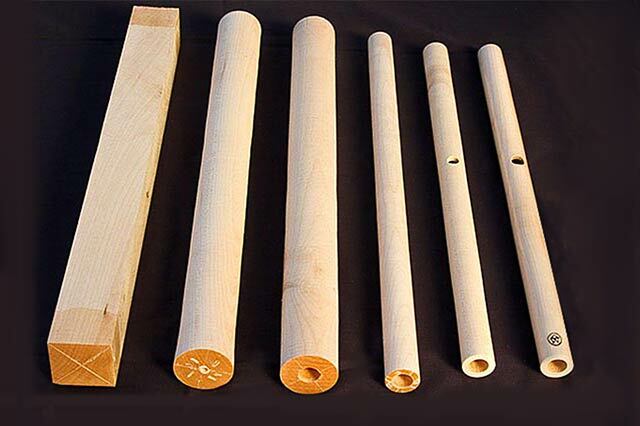 For wind instruments, and especially those also used by children, safety and hygiene are of great importance. 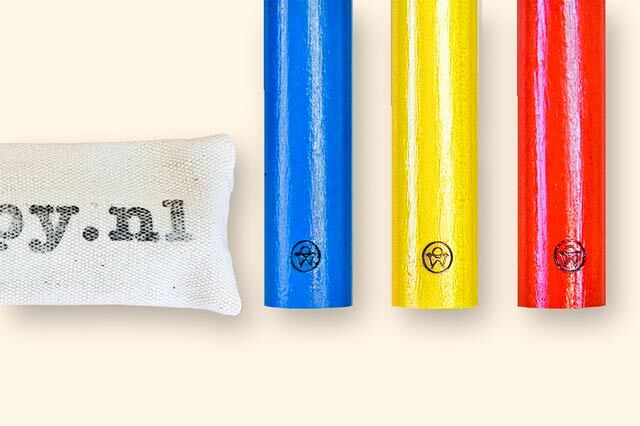 To protect against moisture and other influences the Thumpy Junior has been coated with a paint, either transparent (Natural) or with a color pigment (colored versions). We have been assured that the paint is environment and child friendly and guarantees a non-toxic coating. To see all legal qualifications of the paint in detail, you can download the Safety Data Sheet of the paint in PDF. 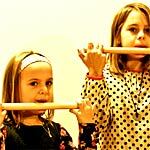 How could the Thumpy flute be used in music education? 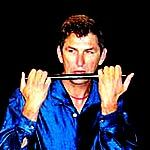 • In the flute lesson: the Thumpy flute can be used in the first flute lessons before touching the Boehm-flute. 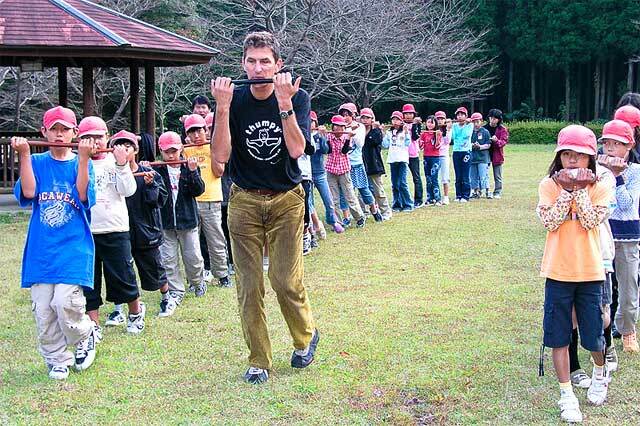 The student will learn how to flute, can develop the embouchure and can enjoy the flute and breath sounds. After some weeks, or months, the student will be ready to change with ease to the Boehm-flute. For those already playing the flute, Thumpy can be used to develop more flexibility in embouchure and breathing as well as to stimulate improvisational qualities. See for more ideas the Flute Teachers page. 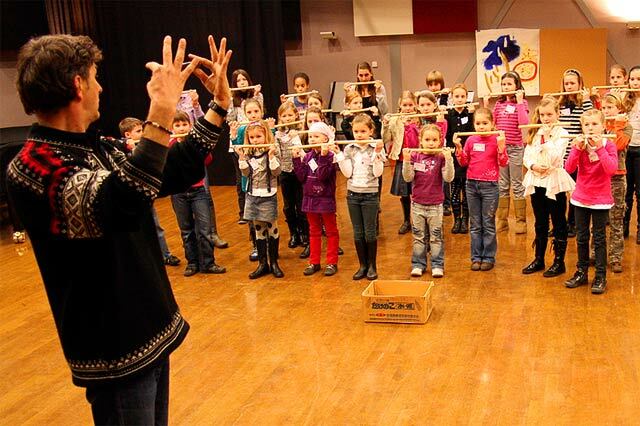 • In musical projects introducing the flute at schools and institutions: Thumpy can be used as an accessible instrument to stimulate musical creativity, improvisation, group interaction and the ability to flute in an enjoyable way. It also can be a help to find out or a student has ability for playing the flute. Why not use the flute's head-joint instead of the Thumpy? Thumpy is more than "using-the-flute's-head-joint" to learn the blowing. 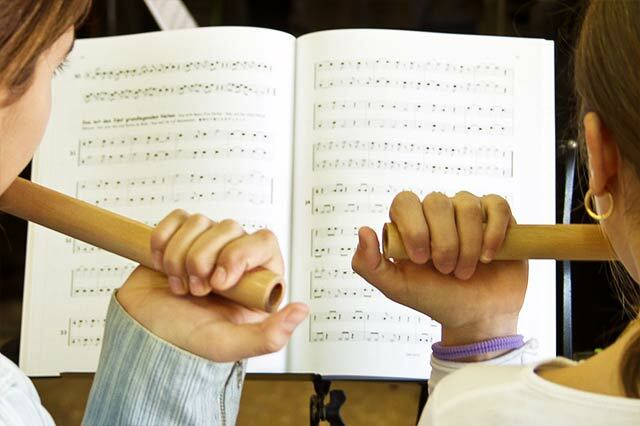 Thumpy is not part of another instrument: it is an instrument, made out of wood, with its own charm, its own scale and its own enjoyable repertoire and lots of possibilities for improvisations, games in groups and music/flute introduction programs at schools. It has no sharp edges and is not as precious and delicate as a head-joint. It is strong and easy to carry around. Should I dry my Thumpy flute after playing? It is advised to dry the flute after playing. To do so, use a rod or stick with a cloth connected (like a flute-cleaner or recorder-cleaner) or a rope with a cloth (like saxophone cleaner). Use the included bag to store it safely and keep it away from any heating or direct sunlight. Do I have to oil my Thumpy? 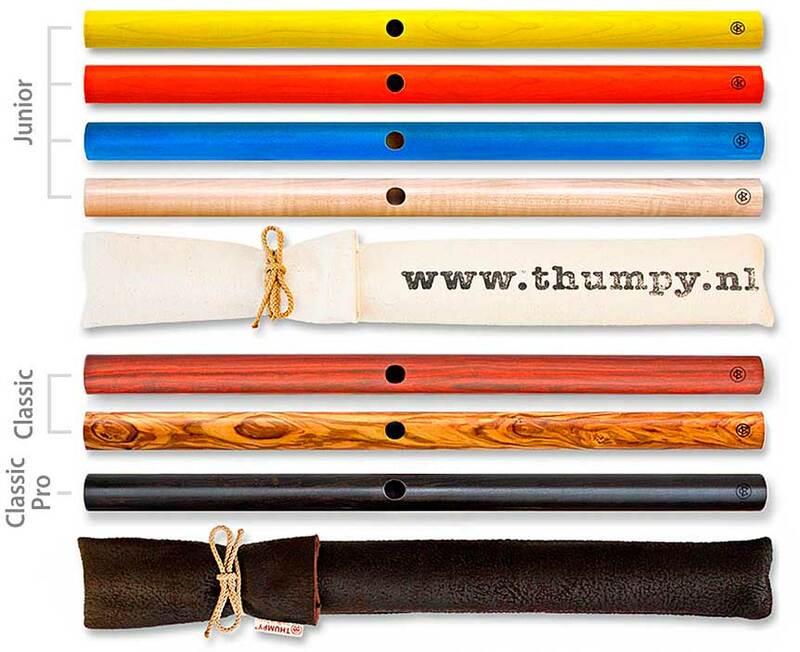 • Thumpy Junior (natural or color coated): No, this flute has a maintenance-free protective coating. • Thumpy Classic (Pro): this model has been fully oil-impregnated during production using a special oil. 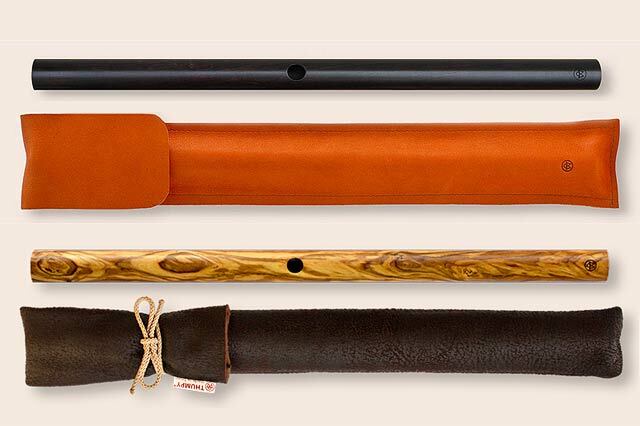 To keep it in good shape, one should rub the flute frequently with a soft dry cloth. Depending on usage, one may also apply a very little oil once a while, like twice a year, to both the outside and inside of the flute, rubbing it strongly with a cloth or rod until the oil is absorbed. Use some wood-oil or otherwise olive oil will also do. Where can I buy the Thumpy flute? The Thumpy flutes and books are directly online available at the Studio E Online Shop. You can also contact with Studio E to inform us your order. Is there any discount if I buy more Thumpy flutes? Yes, there is a quantity discount in the Studio E Online Shop: order for more than €300 (excl. VAT tax) and you will automatically receive a 10% discount. What is your production capacity per year? As each flute is fully handmade, we have a limited capacity to make about 500 Thumpy flutes each year. About 10% are Thumpy Classic (Pro) models, while the other 90% are Thumpy Junior models. Whenever you have any further question, please feel free to contact with us anytime and we will reply as soon as we can. Thank you for your message.